The Success through Value Delivery (SVD) tool was developed based on extensive research across a number of countries, and two different approaches to stakeholder engagement were identified; the value proposition approach and the value delivery led approach. The latter types of organization generally outperform the former. The SVD tool is a sophisticated instrument that can identify the extent a value delivery culture exists in your organization and its ability to deliver outstanding value to your stakeholders. Value propositions are derived from the competitive advantage enjoyed by the organization in attracting customers and maintaining focus. Creating an effective strategy to support the value proposition helps the organization in its market positioning and building. On the other hand value delivery is about continuously ‘proving’ the strategy every day by gathering evidence to test the strategy. Realising sustainable success is about value delivery not value proposition. Whilst strategy is important, it’s also about strategy execution. The key to long-term success is getting the balance between the reality of engagement and the reality of how people identify with the structure of the organization and the supporting systems. Thus, it’s about the delicate relationship between engagement and alignment to make things happen now versus strategic thinking which aims to shape the future. Have the ability to effectively implement strategy. Strategic success is about being able to effectively formulate, debate and implement the strategy. General Managers of the organization. Alignment of thinking requires that the views of each of these three groups are closely positioned. If one or two of these groups are misaligned then there is a ‘faultine’ which could lead to a blockage to effective strategy implementation. Between the Executive/Management Team and the General Managers. Being able to create or to replicate? Being pragmatic or to formulate? If views of individuals and groups differ then how important is this in terms of delivering value? 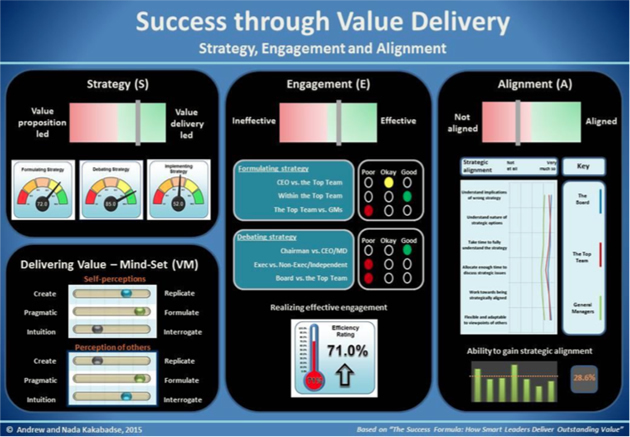 The dashboard summarizes the key outcomes and the relative positioning of the scores for Strategy, Engagement, Alignment and Delivering Value Mind-set.